I have a blue Obsession! This is what I wore today to feeling the blue! Thanks to Nany`s Kloset and Flor de Maria for invite us to the weekly challenge! Tengo una obsesion con el color azul! Este es el look que me puse hoy para sentirme azul! Gracias a Nany`s Kloset y Flor de Maria por invitarnos a sus retos semanales! Loove that blazer! From head to toe, everything you're wearing with it is fab. love the hole look! the blazer with the converse mix very well! wow, great blog. I love those outfits. The blazer really got me and those pictures are so well-taken. Congratulations! Your blog is great I really like it!! That blazer is gorgeous! I love the colour. I love blue too! Your photos are gorgeous, stunning girl! You look great)))Sunglasses are cool)Love ray ban! I love the entire outfit!!! The color of the blazer and the converse are fabolous!!! Beyond chic! That blazer is such a stunner, and wow the clutch totally love it, once again you've done a great challenge dear! i love it! super chic! I love the blazer, that color is chic! demasiado hermosos los tonos de color azul!! me encantooo!! no tienes idea!! voy a guardarlo a mis favoritos... so chic! Me encantó la elección de combinar las Converse con el blazer. Las fotos tan hermosas, como siempre! Cute! 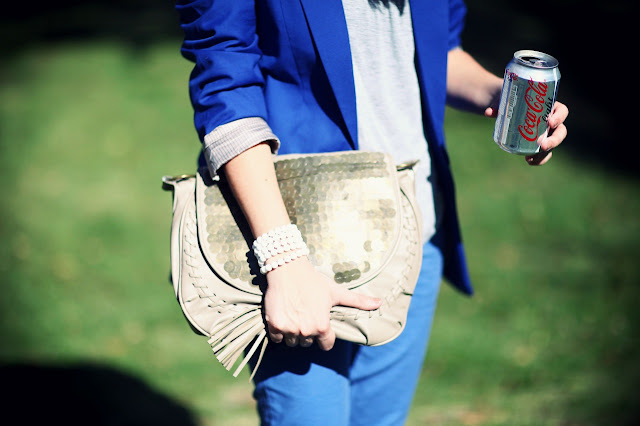 Love love love how you paired it with all the blue! esta temporada el azul nos busca por todos lados asi que esta muy bien!! jaja... el outfit te quedo super chic!